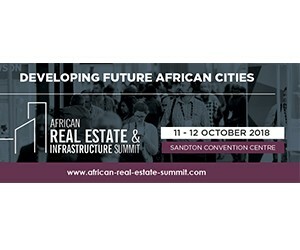 The organisers of the African Real Estate & Infrastructure Summit have announced the gold sponsorship of Utility Systems, an industry leader in the field of remote communicating electronic water control valves and STS prepayment devices. The opportunities and challenges in the South African property sector, from commercial to residential, will be in focus at the summit that returns to Sandton from 11-12 October. Some 200 property professionals are expected to attend this award-winning real estate event. During the same week as the African Real Estate & Infrastructure Summit, the award-winning Property Buyer Show also returns to Gauteng from 12-14 October at the Sandton International Convention Centre. The Property Buyer Show is a unique, proven format exhibition aimed at first-time residential property buyers or real estate investors and earlier this year won the AAXO ROAR Organiser and Exhibitor Award for the Best Consumer Exhibition 6000 sqm and under. The African Real Estate & Infrastructure Summit was also voted Africa's best Confex (half conference, half exhibition) at the 2017 AAXO Roar Awards. The summit and the Property Buyer Show are organised by the multi award-winning Spintelligent, well known for organising exhibitions and conferences across the continent in the infrastructure, energy, mining and agriculture sectors. Longstanding flagship events by Spintelligent include African Utility Week, Future Energy Nigeria (formerly WAPIC), Future Energy East Africa (formerly WAPIC), Agritech Expo Zambia, Kenya Mining Forum, Nigeria Mining Week, DRC Mining Week. Spintelligent is part of Clarion Events Ltd, based in the UK.